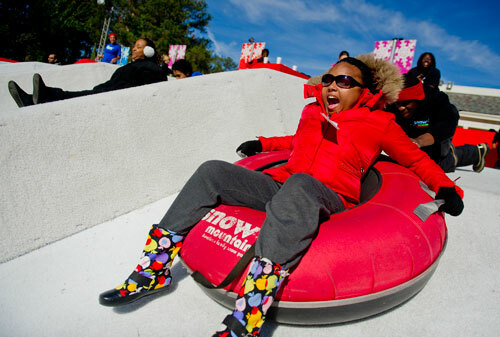 Snow Mountain at Stone Mountain Park is a winter wonderland full of real snow! With a 400-foot tubing hill and 2 moving sidewalks to take you back to the top, your Snow session will be packed with fun. Snow Mountain offers single tubes, double tubes, and family-sized tubes that can accommodate up to 8 guests at a time. Due to the popularity of Snow Mountain, tubing is offered in 2-hour sessions and advance reservations are highly recommended to guarantee the day and time of your choice. The Snow Zone play area is included with your Snow Mountain tubing session and is available during operating hours on the date of your visit.